Stefan Giselbrecht has launched a new Kickstarter campaign for his power saving GPS and GSM development board which is aptly been named to the µTracker. 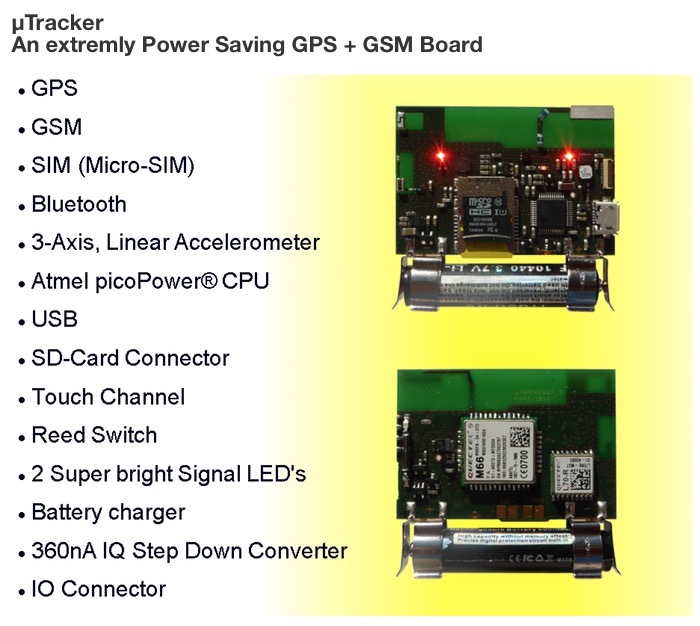 µTracker is a GPS + GSM board optimized for low Power consumption with many features you will like. Ready for your ideas come to life! After several tests we decided to use OEM-modules from Quectel (M66, L70) because of their superior performance and size. Antennas are integrated in PCB, using ceramic technology. GSM antenna is optimized for GSM900 and GSM1800 (both used in Africa, America, Asia, Australia, Oceania, Europe). GPS antenna has a gain of 2.56dBi and is combined with a LNA having a noise figure of 0.55dB and a gain of 19.6dB. Since GPS is one of the key features this is assuring best possible performance. There is also a Bluetooth antenna integrated, supporting the Bluetooth function of the Quectel M66 module. 3-Axis, Linear Accelerometer: FXLS8471Q featuring very low power (8uA at ODR 12.5Hz) and a 192 Byte FIFO, reducing CPU load in sleep mode. Atmel picoPower CPU: ATUC256L4U having the resources you need. Main focus when selecting this CPU was power saving. 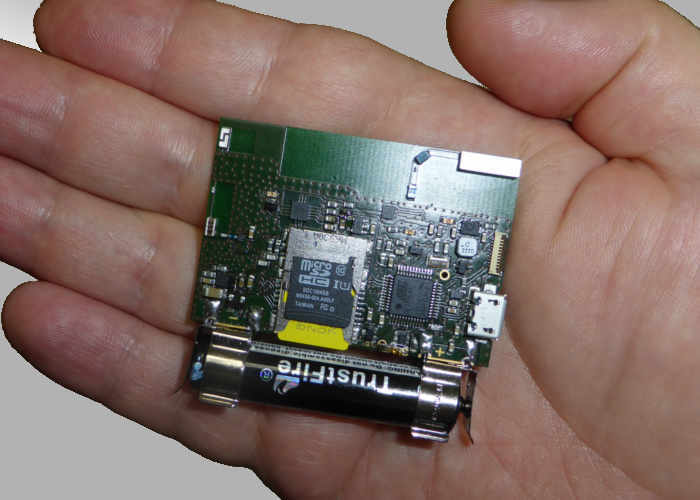 It can run with extremly low power and still has up to 64DMIPS Running at 50MHz when needed. Tools are free available from Atmel (Atmel Studio and Atmel Software Framework). USB (Micro-USB connector) can be used for data exchange and charging, SD (Micro-SD connector) for data storage and firmware download. Both USB and SD are supported by ASF. For full specifications and to make a pledge to help the µTracker go into production jump over to the Kickstarter crowdfunding website via the link below.